The eBox 3350DX2-AP is an energy efficient, small form factor PC designed for light weight applications (including Robotics). This Compact PC is built on the Vortex86 SoC processor also used in the very popular Roboard. In this version the Vortex86DX2 is used, which includes the VGA and HD Audio chips built into the processor and a fastest BUS between the CPU and the onboard DDR2. With 9.5cm X 9.5cm X 2 cm this PC is smaller than FitPC2 and is extremely energy efficient (2A @ 5V). 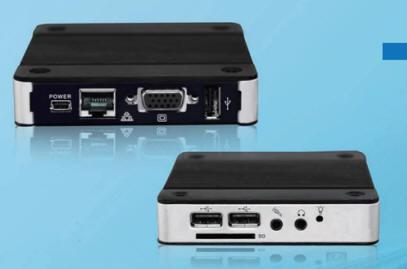 It includes 3x USB 2.0 ports, Audio In/Out, 1 Ethernet port and 1 VGA port. HDD is provided through an SD card slot. The 3350MX supports x86 operating systems including Linux, Windows XP, XPe, CE6.0 and Compact 7. Measuring 95mm X 95mm X 2mm the eBox 3350 is one of the smallest PCs in the world. The fanless design and ultra low power consumption makes it ideal for Robotics and other Embedded Applications. This AP version adds Automatic Power on making it ideal for Embedded and Always On solutions. 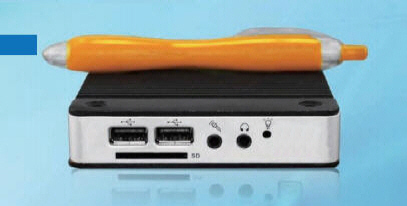 The eBox 3350 does not have built in Robotics features like the Roboard does but instead concentrates its IO on the USB ports and packs twice the memory (512 Mb) and built in VGA. Separating the Logic / Operating system part from the Robotics tasks is the technique employed by some latest robots such as the DARwIn-OP robot. In addition the ultra low power consumption makes it ideal for Robotics apps. The eBox 3350 is not limited to Robotics applications. You can use the eBox 3350 mini PC as a Home Server, NAS device, companion PC for your TV, Thin Client, and much more. Please note: the Power Adaptor is NOT Included. DMP Power adaptors for the 3350 series are available here. You can also use a miniUSB Smartphone charger but please see notes about this bellow. You can also use a miniUSB Smartphone charger capable of at least 5V 1A although we strongly encourage using official model from DMP: bear in mind the 3350 needs up to 2A at 5V when all 3 USB ports are in use and not all Smartphone chargers are capable of delivering a steady 5V or enough current.